A Wisconsinite is reminded he is in Madison, when, looking for a parking place, his car rolls by a lot with a sign that states, “Private Parking; Violators Subject to Karma.” I did find a space, parked, participated, even found my car again, and write to you in a coffee shop in town – well, a Panera Bread, but complete with be-bop on the PA. No beret and goatee combos to be seen, though, at least not at a chain store shop, circa 2011. I’ll use this space to click off a few quick reflections, please pardon the first person voice. And firstly, I’m pleased my voice made it through the day. 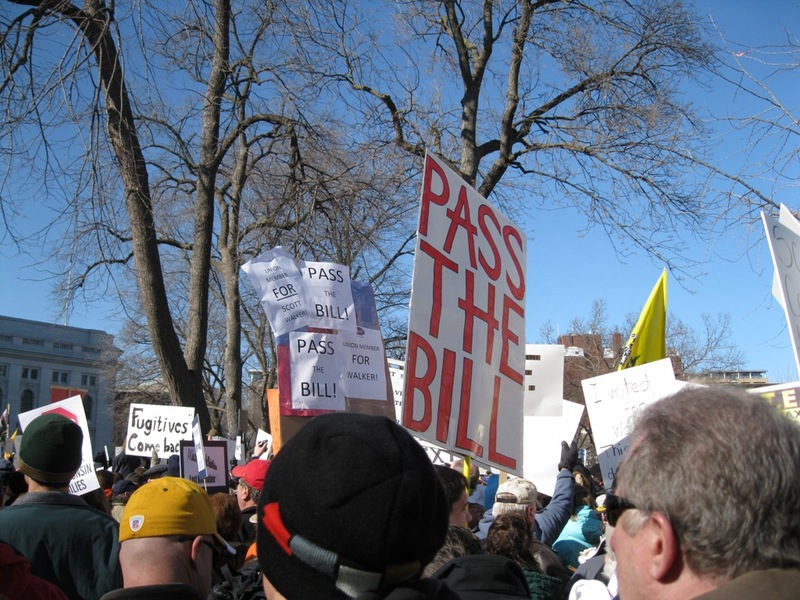 I had numerous conversations and confrontations with the pro-union crowd, brief “dialectic” samplings, usually of my own choosing, sometimes with individuals, sometimes with sections of the crowd. No pictures, at least yet, sorry. Please pardon, if you catch typos or editing errors. Unionists were there from many unions, mostly in Wisconsin, but with ample supplement from other states, I am sure. It is highly organized by middle-aged, cell phone toting, progressive warriors, in red (Badger red?) windbreakers. There was a fairly large minority of out and out communists at the rallying and one is confident they will keep pushing along till the day it closes. Make no mistake, when one sees the black attire on the under-50 folks, one almost always finds a communist, not a libertarian anarchist. They just want to look like the latter and along with NBC TV’s venerated Tim Russert, who changed the media’s election map colors, realize that red is long out of style. Well, I think so, granted there was a lot of red in the crowd (right, right, right, Badger red). I confronted numerous ravens (what I tend to call communists in black) and those who touted the clenched fist symbol. Some wanted it known they were communists. Others were shy to admit they were socialist, though vociferous in trying to shout me down; but eventually they confessed, having been shown up for their not wanting to say so in mixed company. So: thoroughly black clothing? Clenched fist? They know why they use that symbolism. One woman who carried the diagonal red and black flag agreed that it stood for anarcho-syndicalism “to some” (anarcho-communism, to others, one of the many nuances and little conflicts they have). It is important to know that to a great majority of the unionist protesters, this really is a matter of whether all-American unions (in their view) go “forward” or “backward,” as one notable sign said. Most of these folks, one may even call populist patriots, as, in some overlapping ways, are we Tea Party folks. We should be neighborly to them, in general and remind them we understand unions have been important in America’s history. However, I saw none of these patriot unionists arguing with the Marxists there to “support” them. I asked one of the more “clean cut” bunches in the crowd, to raise their hands if they were “progressives,” then to do so again, if they were “socialists.” Nearly all lifted up, the first time; maybe one, the second. I did find some interest in honest discussion, being peaceably accosted after the event was dwindling. I’d guess he was a low-level union organizer. The word from him and the others is that Scott Walker is infamous for his iron-handed, anti-union tactics as Milwaukee County Executive and they believe that is why he was promoted as the GOP candidate for Governor — to break unions of all sorts, in Wisconsin. It is important to know what people believe, whether it is true or not, or how they have come to believe it. We agreed that we all need to observe both politicians and union bosses, for their intentions — or any of the powerful. That agreement even came after I told him how I know AFL-CIO boss, Richard Trumka is a communist collaborator. To these relatively honest unionists, it is not about pension contributions, it is about collective bargaining and Gov. 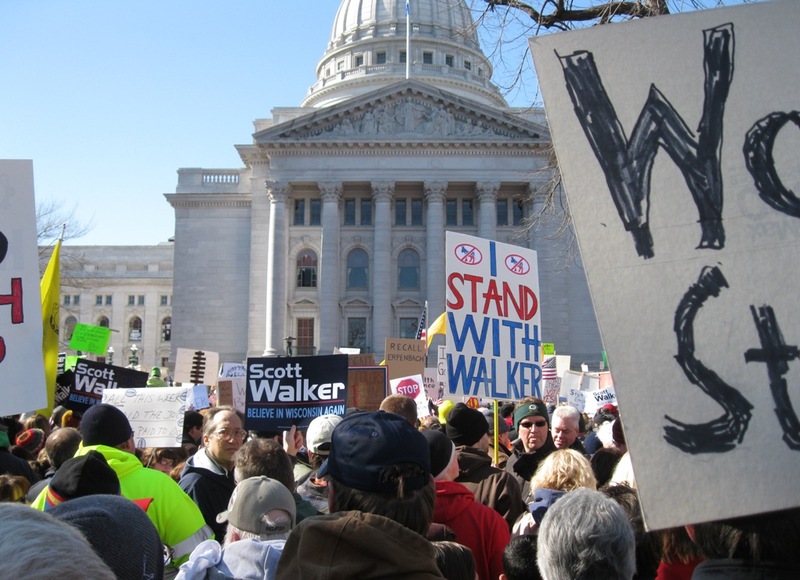 Walker must address that head-on, as did radically progressive president, Franklin Roosevelt (he was hard against collective bargaining for public workers and took some pains to explain why). So, let that be the issue it is, please and tell us what is on your heart and mind about it; some friendly advise, Governor. I was chatting with a couple compatriots, when two young people with a video camera came by, asking questions. After a few q’s and a’s, I decided to give them the low-down and told him it is ironic that so many of these workers, if they all have their way, will find themselves working for “the man,” all over again, but the boss they get will be the global man, running the whole world like one, big, controlling corporation — or state — look at it either way. After I named a few names in the mix (how Rockefellers and other tycoons and their foundations have worked with global Marxists) he asked me if I were a conspiracy theorist. One of the others and I affirmed that it is no conspiracy anymore, since the globalist controllers have made their goals known (see Council on Foreign Relations, Aspen Institute, Agenda-21, Maurice Strong, George Soros, Ban Ki-moon, etc.). One of the more vocal union demonstrators asked if I were a Beck follower. I told him I work among people who write about what he talks about a week or two later. A Trotskyite (“Trotskyist,” he insisted) with whom I spoke, had a table with literature there. I asked him a number of questions and his answers were consistent. He blamed the failure of the Soviets to reach the communist ideal upon their being run into ruin by foreign capitalists, along with Russia’s being corrupted by Stalin’s bureaucratic politics. He didn’t mention the millions of murders. His solution is to foment a more truly communist revolution and assure that it is completely global. I asked him what he thought of perhaps a couple of the names listed above, and of, say, Mikhail Gorbachev, or Barack Obama. He said their globalist plans are not communist enough, in essence. One pro-union demonstrator told me he was CEO of a business with a sizable number of employees. I asked him why his sign was so negative about Limbaugh, Beck, etc. The main thing I stressed with him was to go to his PC and read about Agenda 21, on the Internet. I wonder how he will budget it all in, not to mention all the other planned, Van Jonesy regulations. There were a few thoroughly patriotic counter-protesters left, around 4pm, an hour after our rally was to end. They were being nearly encircled and shouted at by an increasing number of the ravens and interestingly enough, other unionists were prepared, forming a line to separate them, in their reflective yellow vests. A few police were there too — presumably to keep the peace instead of joining the other unionist protesters. I decided to chip in and briefly spoke to the few and proud that remained (it was getting kind of boring, anyway). The message went something like this. I reminded them all, of the importance of unions in our history — even of some of the important initiatives of self-described progressives in America… a hundred years ago. I told compatriots, when you talk to these pro-union neighbors, please warn them of the union bosses (such as Trumka and SEIU’s Andy Stern) who have been outed as Marxist controllers. I asked people of both sides, to go to the Internet and read about such things as “the Cloward Piven strategy” to overrun the budgets of America, so that our public financial system collapses, and to thus turn so many government-dependent Americans into an angry proletariat majority — all so they can have their Marxist revolution. If we allow that to happen in Wisconsin and America, its turmoil would make what is going on now in Madison miniscule, by comparison. Now, I’m going to listen to what Andrew Breitbart had to say to National Review Online at the day’s events and drive home.